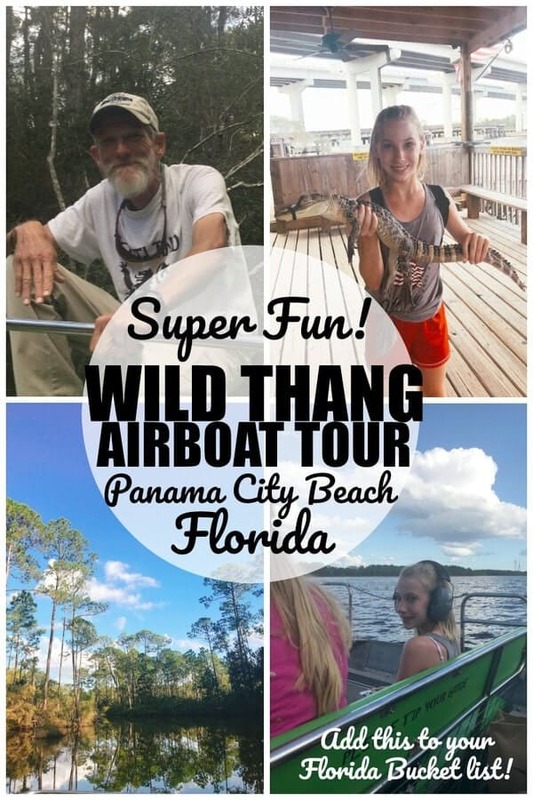 When you are heading to Panama City Beach Florida then one activity that you are going to want to add to your itinerary is an airboat tour in Panama City Beach. 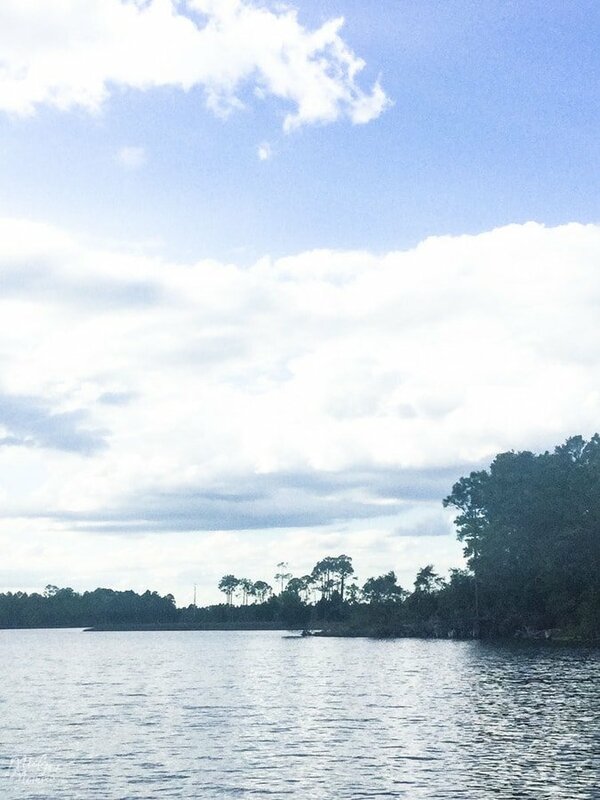 We took an Airboat Ride through West Bay with Wild Thang Airboat Tours and it was so much fun! Now I have to say, that at first McKenzie thought the airboat ride was going to be boring. She also thought that it would be totally gross to hold a gator. I am happy to say, that once again I got the “Mom you were right”, after we were done! Win for MOM! Yes! We all know that having the kids enjoying themselves is the whole point of traveling. 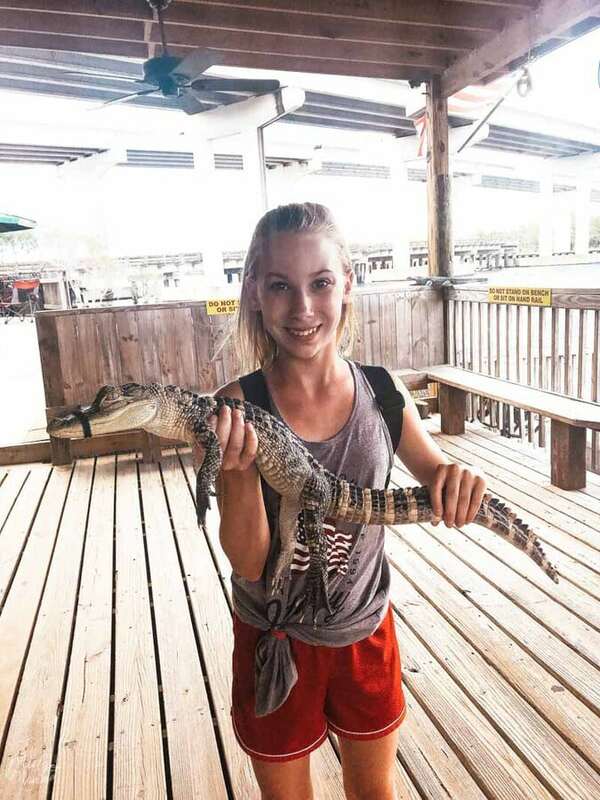 The fun starts before you even get on your airboat ride when you are at Airboat Ride through West Bay with Wild Thang Airboat Tours is you can see the gators that they have living there. This is not an always happening thing, but there are times when they are taking care of baby gators and you will be able to hold one! If you are wondering what an airboat is, it is a flat hulled boat with bench-style seating with a propeller in the back serves as the engine and rudder for steering. 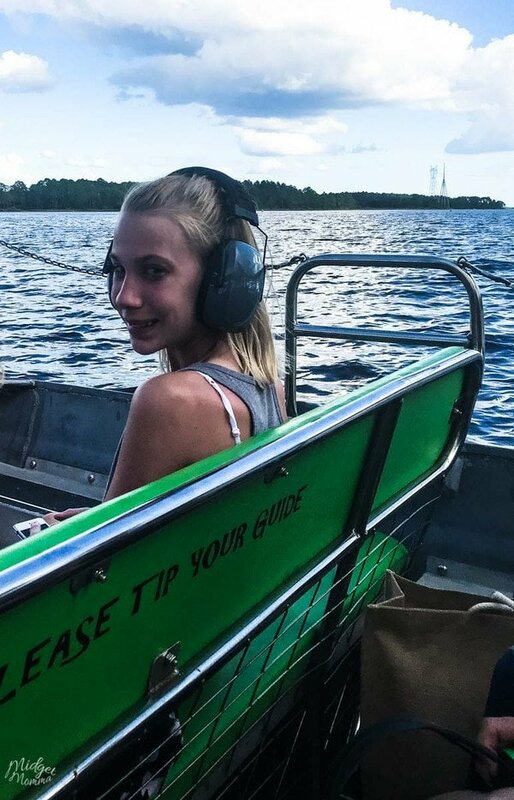 The Airboat Ride with Wild Thang Airboat Tours takes you on a very scenic trip around areas of the intercoastal waterway and the Gulf of Mexico! Along with seeing the beautiful and natural area you will also have the opportunity to see wildlife in their natural habitat too! Obviously, there is not guarantee that you are going to see wildlife, because you are 100% in nature the chance is there. Some of the wildlife that you could see on your airboat tour are; We’ve seen dolphins, alligators, sharks, manatees, snakes, stingrays, crabs, jellyfish, turtles, catfish, bass, alligator gars, etc., and let’s not forget deer, wild hogs, bears, bald eagles, osprey, herons, egrets and more! Our tour guide and captain was AMAZING! He was cracking jokes, telling us information about the area we were traveling in, history about the area and more. He was totally engaging with all of us on the tour boat. Oh and I can not forget the 180 spins, that he did with the airboat. Those were pretty wild, totally unexpected but totally fun! While we were on our tour, we did not get to see any gators that were in the wild, but that didn’t take away any of the fun that we had. The ride, the views, the captain made it totally amazing and seeing gators would have been an added bonus, but not needed to make the experience amazing. There are 3 different tours that you can pick from, so there is plenty of options to pick one that works with your family and your schedule. We went on the 1 hour ride and I think it was the perfect length for an Air boat ride. 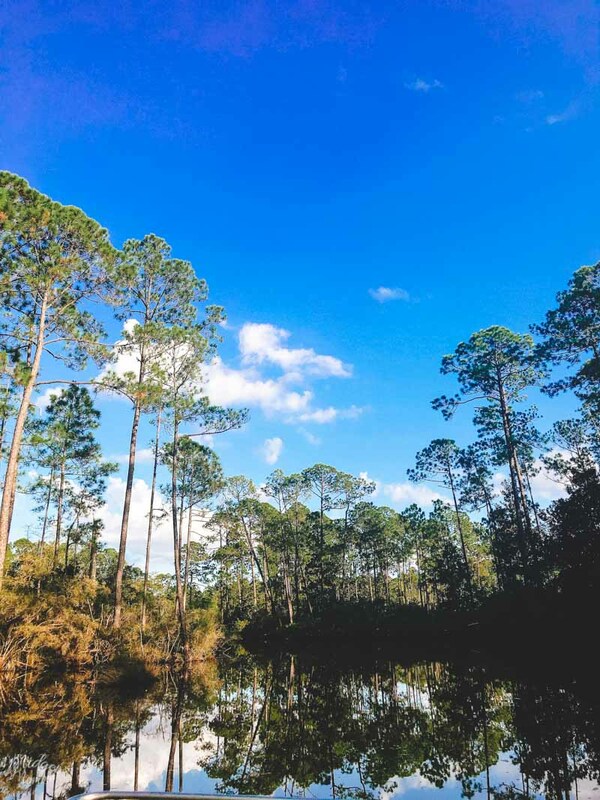 1/2 Hour Airboat Ride: Have an idyllic and enjoyable ride with great scenery and may have the chance of a dolphin encounter and observing our native birds here in Florida. Length of boat ride is 30 minutes. 1 Hour Airboat Ride: The one hour trip give the opportunity to go to the bigger creeks which are further away from the Airboat docks. 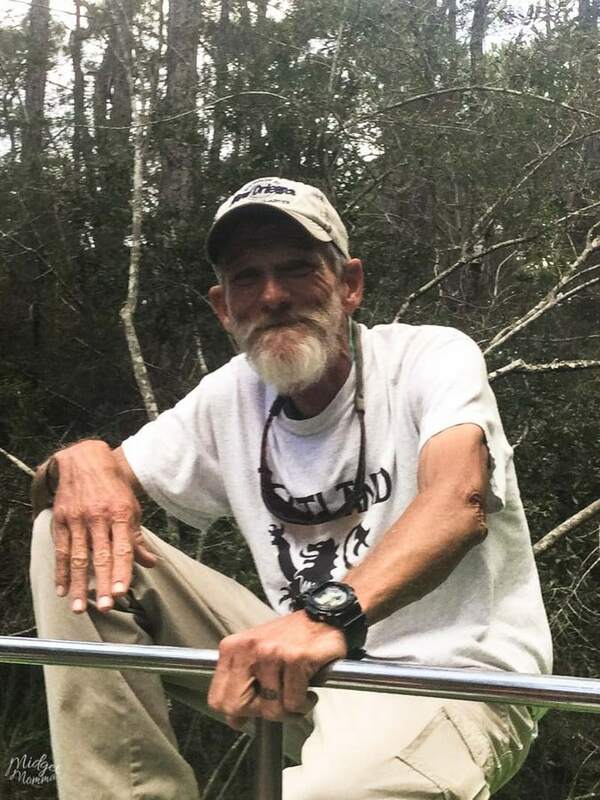 This is the trip to go on for a great chance to see gators along with all of the beautiful and natural scenery, because the creeks are where the baby alligators hang out. Sunset Airboat Ride: This trip is an hour and a half long. You leave the dock right before sunset and get to see what a Florida sunset looks like from an airboat. Night time is the best time to see gators, and once it gets dark the captain and crew use their spotlights to shine the “red eyes” of the alligators, which makes it easier to see them. Should my family take an Airboat Tour? Head on over here and you can see all the information on how to make a reservation for your tour with Wild Thang Airboat Tours. Be sure to check out more fun you can have in Panama City Beach Florida! Panama City Beach Restaurants that have AMAZING food!